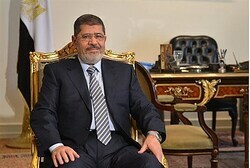 Former Egyptian president Mohammed Morsi stood trial in Cairo for the third time since he was toppled Sunday – this time, on terror and spying charges, according to BBC News. Morsi is on trial with 35 others accused of working with Lebanese and Palestinian Arab groups to carry out terror attacks in Egypt. The trial is yet another step in the country’s crackdown on activity by the Muslim Brotherhood, Morsi’s party, which Egypt declared a terror group in December. Security around the courtroom was tightened as the court session loomed, according to Al-Ahram, with dozens of police vehicles and security checkpoints surrounding the building. But the main hindrance to the trial proved to be not Muslim Brotherhood supporters, but the defense itself – which walked out of the courtroom in protest just after the trial began after Morsi and the other defendants were placed in a soundproof glass partition some compared to a cage. The defendants claimed that they could not hear the proceedings during the trial, according to BBC News, due to the arrangement; the prosecution insisted that headphones placed inside the glass area allowed them to follow the trial. However, that was not enough for the defense, who stormed out of the courtroom anyway, citing other civil rights violations, including the claim that Morsi was not allowed to see his family nor his lawyer before the trial, according to CNN. It is unclear why the defense has decided to walk out now over the partition, which was also present at a different trial against Morsi in January. According to Al-Ahram, the trial not only accused Morsi of working with the Muslim Brotherhood, but expanded into an international fight on terrorism. The defendants included Lebanese men, who were accused of working with Hezbollah, and Palestinian Arabs, who were accused of working with Hamas to attack targets in the Sinai desert. Of the 35, 19 are reportedly already behind bars; the remaining 17 have arrest warrants issued against them. Some of the defendants implicated in terror include Morsi’s presidential aides, including former national security advisor Essam El-Hadad. For all, the charges are severe; the prosecution accused each of them of acting “with the purpose of terrorizing the Egyptian people, stirring chaos, infringing upon the independence of the country and its territorial integrity as well as the unity of the people, and foaming sectarian sedition with the aim of igniting civil war in Egypt,” according to CNN. This is only the tip of the iceberg for Morsi, who face a total of four legal trials against him, BBC News notes. Besides for Sunday’s conspiracy trial, two other trials have begun: the first, which began in November, holds him responsible for killing protestors outside the Presidential Palace in 2012; the second, which began in January, cites his role in a 2011 jailbreak which saw the deaths of several police officers. A fourth trial will be held over charges of insulting the judiciary. Sunday’s trial signifies yet another step by Egypt against the Muslim Brotherhood – Egypt’s homegrown terrorism – and against external terror, particularly in the Sinai Desert. The targets there include Hamas, with which Morsi’s government was friendly, and which the current government accuses of a December attack on Egyptian police headquarters, and planning church bombings in Sinai last Christmas. Hamas has denied the Egyptian government’s allegations, claiming they were an “attempt to demonize Hamas”.